The Germans counterattack the US 752nd Tank battalion. German accounts indicate that their strength consisted of two Tiger tanks, one StuG III, and less than 50 grenadiers from the I./SS-PGR 35 of the 16. SS-Panzergrenadier-Division RFSS. Twilight was approaching as the Germans attacked, but there was still sufficient daylight left and visibility remained good. The sun was just above the horizon, and the moon was nearly at full transit, and three-fourths illuminated. The German column was led by Tiger 221 of the 2nd Platoon of the 2nd Company of the 504th Heavy Panzer Battalion, commanded by platoon leader Leutnant Keitel. The grenadiers were following their tanks in close ranks, in columns of two on either side of the road. The counterattacking column halted briefly in the cover of the brick factory that still exists today in the northern part of Cecina. Resuming its counterattack, the column advanced down a road from the vicinity of Villa Bianca, and turned left onto Via Marrucci. Moving slowly past Via Trento and Via Trieste, Tiger 221 began to negotiate a curve to the right onto Via Montanara, which was a gravel road that formed the eastern border of the town. Meanwhile, the five Sherman tanks of B Company's 3rd Platoon went out to meet the German counterattack. The platoon leader was Lieutenant Edwin W. Cox, commander of Sherman 11, which was a mid-production 75mm M4A1. Lieutenant Cox's plan was to advance toward the brick factory near the northern part of town, where the German column had first been spotted. As the 133rd Infantry took cover in the buildings in town, Lieutenant Cox strategically dispersed four of his five tanks into the streets of Cecina, then took his own tank alone up Via Montanara in an attempt to intercept the advancing German column. The German and American lead tanks were about to come face to face with one another, but neither crew was aware of this because the topography and buildings obstructed their view. Cox's Sherman had just passed Via Manzoni on its left. Just moments before Tiger 221 rounded the curve onto Via Montanara, the crew of Sherman 11 spotted a German infantry soldier in a ditch alongside the road. Unknown to the American tankers, the German scout was acting as a "spotter" for Tiger 221. As the infantry scout stood up to motion the Tiger on, he was immediately hit by machine gun fire, clasping his stomach as he fell. As the German spotter fell, the Sherman tank crew saw the main gun barrel of Tiger 221 emerge from behind a two-story house on the left side of Via Montanara near the curve in the road. At that moment, Tiger 221 rounded the curve onto Via Montanara and came face to face with the Lieutenant Cox's Sherman, at a distance of 75 to 100 yards. Both tanks fired simultaneously. The Tiger's 88mm shell struck the ground close to the left side of Cox's Sherman. The concussion of the Tiger's shot lifted the left side of the Sherman off the ground, but no damage was inflicted. At the same instant, the Sherman fired a 75mm armor piercing (AP) round, hitting the lower front hull of the Tiger. 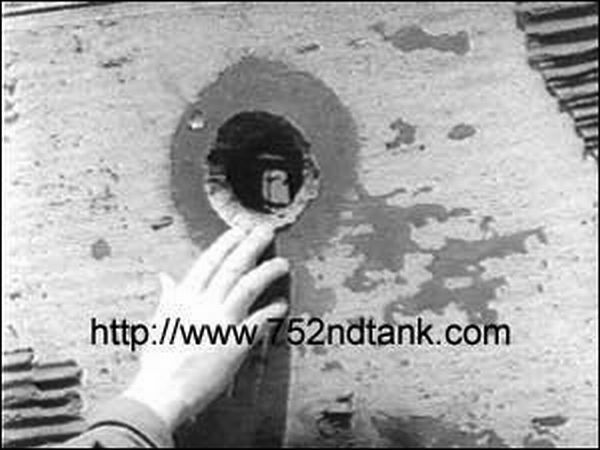 Crew members of the Sherman recalled seeing the shell merely bounce off the Tiger's hull. The only damage inflicted upon Tiger 221 by this hit was a chip in the Zimmerit coating, which is clearly visible in after-action photographs. The two tanks momentarily lost sight of each other in the dust that had been raised by the firing and movement of the tanks. Tiger 221's crew was further handicapped by the loss of their infantry spotter. Lieutenant Cox ordered his driver, Sergeant Raymond Holt, to back Sherman 11 into the dust, and then turn left through a small garden and position the tank tightly against the wall of a two-story home midway between Via Manzoni and Via Marrucci. In this position, the front of the Sherman was facing Via Trieste, and the rear was facing Via Montanara, where the Tiger remained. Lieutenant Cox then traversed the turret to the rear of his tank, with the main gun at the 5 o'clock position. Lieutenant Cox positioned his tank in that fashion to allow for a more rapid escape in the event that the Tiger approached from their rear and could not be successfully disabled. He had taken a calculated risk that the Tiger 221 would continue along its original path, and cross in front of their traversed main gun. Sherman 11 maintained this position for several minutes, while the German armor (or perhaps U.S. artillery) shelled the surrounding buildings. When the shelling stopped, Tiger 221 slowly lumbered down Via Montanara, unaware of the position of Cox's Sherman. 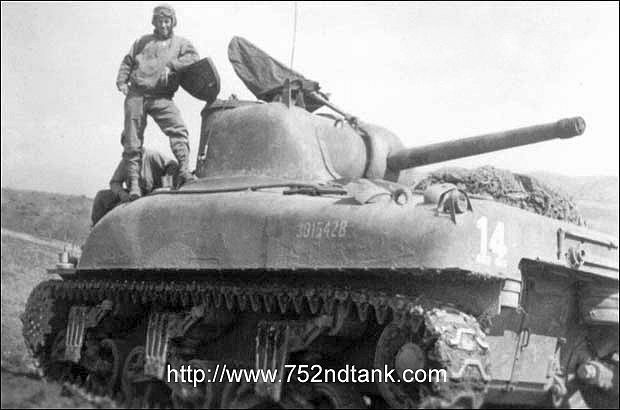 In recent interviews, Tiger 221's crew members say that they believed the Sherman was in some brush to their 11 o'clock position. The time was 2045 hours. Tiger 221 slowly rumbled down Via Montanara, crossing the position of Sherman 11, which was hidden behind the building. With its crew unaware of Sherman 11's position, the Tiger moved perpendicular to the Sherman's rear and directly in front of its traversed main gun. As Tiger 221 slowly crossed before them, Lieutenant Cox calmly told his gunner "Hold on, hold on…" until the Tiger was squarely in front of them. Employing a tactic that exploited the Tiger's thinly armored sides, Lieutenant Cox then gave the order to unleash an armor piercing (AP) round through the Tiger's right rear sponson, into the fuel tank. Crew members of Sherman 11 estimate that they were between 25 and 30 yards from Tiger 221 when they fired. The very close range is corroborated by infantry eyewitness reports, by the commendation for the Silver Star that was later presented to Lieutenant Cox, and by detailed maps and photographic evidence. 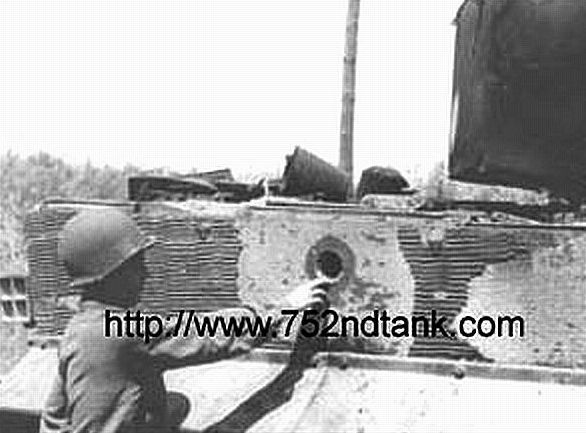 The 75mm AP round penetrated Tiger 221's hull and immediately ignited the fuel tank. Eyewitnesses from both the 133rd Infantry and the Sherman crew say that Tiger 221's engine compartment burst into flames when it was hit. Just a few seconds later, Sherman 11 fired another round into the Tiger's right track for good measure, severing it. 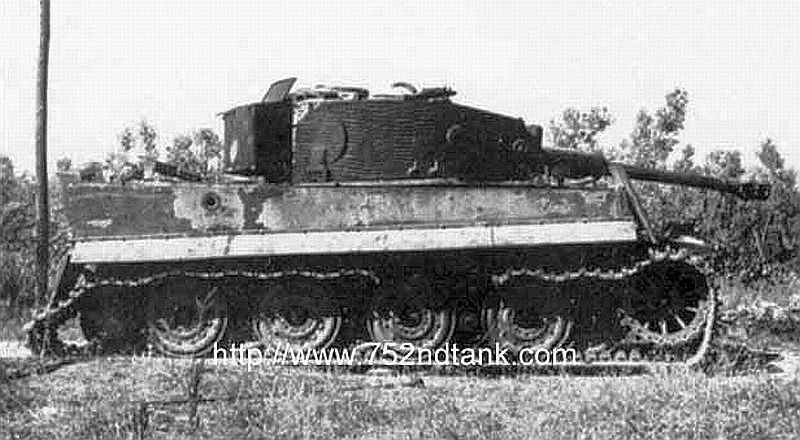 Side view of Tiger 221. Note the charred turret, track damage, and missing Zimmerit coating. The Tiger crew believed Sherman 11 was hiding in the brush to its 11:00 position, thus explaining why the main gun is pointing away from the direction of the penetrating hit. The main gun is in full recoil position, not due to self-destruction as speculated elsewhere, but rather due to the intense internal fire and internal ammunitions explosions that severed the hydraulic lines. The Sherman's gunner and loader both recall seeing some of Tiger 221's crew escape from their disabled tank after the fuel tank was ignited. Surprisingly, all of Tiger 221's crew survived, though four of them were wounded, and two were in serious condition. The German crew escaped in the midst of heavy machine gun and small arms fire into the ditch on the side of Via Montanara, where they were rescued and attended to by their own infantry. After its crew escaped, Tiger 221 exploded when the spreading fire ignited its full load of ammunition. The after-action photographs show that the internal explosion was violent enough to buckle the hull roof above the radio operator's position. The intense heat of the internal fire brought the main gun into full recoil position. Based upon interviews with a surviving crewmember of Tiger 221 as well as numerous eyewitness accounts on the American side, Tiger 221 was not self-destroyed by its crew after it was hit, despite previously published speculation. With Tiger 221 disabled and burning, the remaining Tiger tank and StuG III withdrew. The counterattack rapidly collapsed with the defeat of Tiger 221, and this remarkable tank versus tank action effectively marked the end of the battle for Cecina. Some light mopping-up operations continued the following day on 2 July. Company A of the 752nd lost eleven of its fifteen tanks in Cecina. Despite the heavy loss of tanks, only six enlisted men and one officer were wounded, and two enlisted men captured. No 752nd tankers were lost in the heavy fighting in Cecina. Lieutenant Cox received a cluster to the Silver Star (his second award) for his "gallantry" and "courageous action" at Cecina. Six other men from the 752nd Tank Battalion also received commendations for their gallantry and heroic achievement in Cecina. This includes five Silver Star awards in addition to the one presented to Lieutenant Cox, and one Bronze Star Award. Tactical diagram adapted from "Tactical and Technical Trends, Publication #40"
Interesting account -- thnaks for the post, POS. Yeah great post POS... thanks for sharing.